Chances are you have found your way to this post via social media and our sneak peak of awesome giveaways! Yes, all of that is happening, but currently, I am preparing for my graduation and pinning ceremony. Since I am busy celebrating I thought we might start out the week with a little bit of history. Keep reading to hear more about our giveaway extravaganza. So what is Nurses Week? National Nurses Week begins each year on May 6th and ends May 12th. The objective of the week is to celebrate nursing as a profession. As well as to recognize the contributions that nurses bring to communities. According to ANA, National Nurses Week was not recognized until 1982. In February of that year, ANA announced May 6 as National Nurses Day placing stress on the United States Congress to do the same. Thus, May 6 was designated as National Recognition Day for Nurses on March 25, 1982 by President Ronald Reagan. In 1990, ANA expanded National Nurses Day to National Nurses Week. In 1997, the ANA Board of Directors requested May 8 to be recognized as National Student Nurses Day. It was not too long ago that Nurses Week did not exist and hardworking nurses were not recognized for their selfless and caring profession. And I think it is very special that it ends on Florence Nightingale's birthday, May 12th. You can never forget about Flo! Although I am not a Registered Nurse yet, I am a graduate nurse and certified nurse assistant. Nursing is such a work of the heart and I truly wanted to say thank you to those who are already or going to be in the nursing profession. Here is what you can expect for our first ever Nurses Week Extravaganza!! 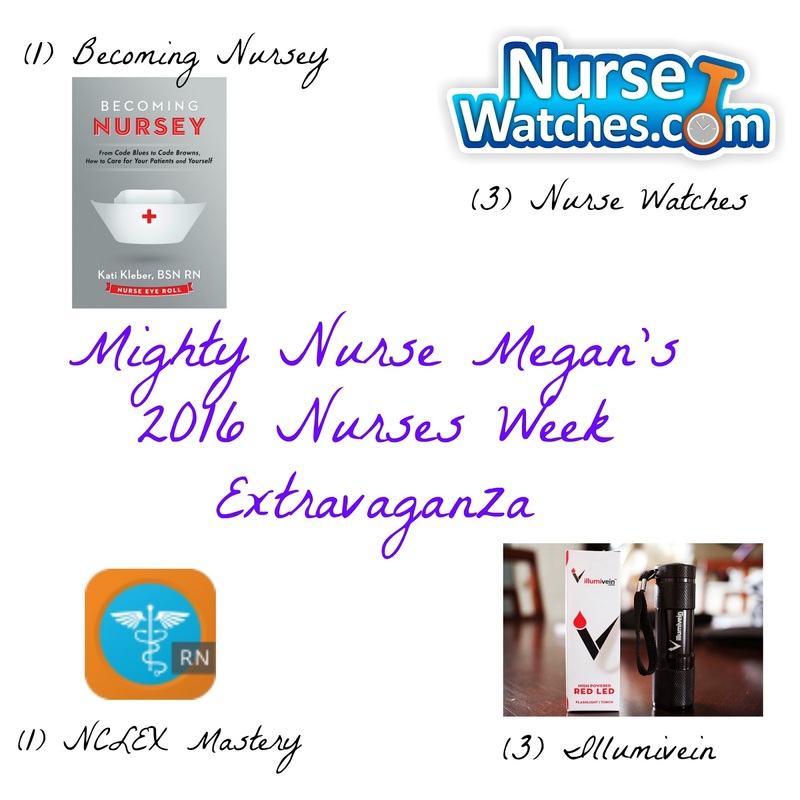 Might Nurse Megan will be offering 5 different giveaways. A new giveaway will be posted each day with different ways to enter. Giveaways will begin on Saturday, May 7th so keep your eye out! All giveaways will be completed by Friday, May 13 and notified winners will have 48-hours to acknowledge before a new winner is chosen. All prizes were either purchased with my own money or donated by the companies. 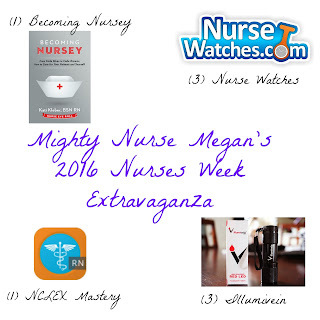 Mighty Nurse Megan would like to thank Nurse Watches, NCLEX Mastery, and Illumivein for donating! Nurses Week is about celebrating nurses. Please remember to thank a nurse!